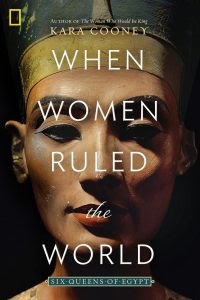 This entry was posted in Books and tagged @tlcbooktours, ancient Egypt, Kara Cooney, National Geographic, tlc Books, When Women Ruled the World by Katrina. Bookmark the permalink. I read this earlier in the month and it seems as though we had very similar thoughts about it. I didn’t feel that I’d learned as much as I was hoping to either – it seemed the author was more concerned with her feminist message. It did leave me wanting to read more about Ancient Egypt, though! I found it quite frustrating as so much of it seems to be guesswork. The strong feminist bits just about had me rolling my eyes at times. I’ve just realized that I have Kara Cooney’s biography of Hatsheput on my shelves – a Christmas gift from some years ago. I don’t think I’ll look for this book, but as I’m trying to read more non-fiction this year I may move the book I have up the pile.